Tyrrell pays tribute to Br Damien Brennan as he targets Cats comeback and his own décima in 2016. Winners alright: Tyrrell collected his ninth All-Ireland medal under Brian Cody in September. KILKENNY ACE JACKIE Tyrrell has his sights set on a perfect 10th All-Ireland in 2016. After a season blighted by injury, the Allstar defender watched as a non-playing sub when the Cats clinched their latest crown against Galway. But he still made his presence felt and delivered a rousing half-time speech as Brian Cody’s side rallied from three points down. Tyrrell committed to another season once he was assured that the hairline fracture in his foot wouldn’t require any further operations. Another medal would see him draw level with the great Henry Shefflin on 10 All-Irelands, though he insists that is not the “driving force” behind his decision to stay on. And although he first tasted All-Ireland glory as captain of the Kilkenny U21s back in 2003, he says he never foresaw the glittering senior career that lay in his future. “In earlier years, going back to 18 or 19, I would have been happy to be a Kilkenny sub,” the James Stephens clubman said. “I don’t know if ye ever saw me playing minor but I wasn’t that good, and my U21 days didn’t get much better. Back then I would have held the water for them. “Obviously when you get in with Kilkenny you get a bit more ambitious. You win one, then you win two, and it kind of just snowballs on from there. Now one of the most decorated men ever to play the game, Tyrrell credits former Kilkenny minor boss and senior selector Brother Damien Brennan with a key role in the transformation. Brennan — hailed by Shefflin in his recent autobiography as “one of the most deeply intelligent people I’ve ever spoken to” — gave him the confidence to perform at the elite level. “(He) put unbelievable faith in me and more or less turned my career around for me. “At that stage I was just there at corner-back and kind of happy to hold my own. After then I just flourished and really came on and really believed in myself. In his book, Shefflin dismissed the suggestion that Brennan is a ‘mind guru,’ and Tyrrell pointed to his influence across a range of areas. “I just met him and had a bit of a chat and he started doing work with me, helping me out: hurling-wish, physically, mentally, confidence. Then I just really blossomed and went from strength to strength after that. He added: “He works in the background and doesn’t want exposure, but he is a great man and he has given me a lot of time and helped me personally and on a sporting level. Tyrrell turns 34 next June, and while he might not have time to eclipse Shefflin’s décima himself, he feels the King’s record is already under threat. “If you’re looking at the age profile of Cillian Buckley (three All-Irelands, aged 23), Richie Hogan (seven All-Irelands, aged 27), those guys have a great opportunity to do it. As for himself, Tyrrell says he’s in better shape than he usually would be at this time of year, and Kilkenny’s Walsh Cup opener on 13 January is already marked in the calendar. He knows that he can take nothing for granted. I still feel that it’s in my hands and that if I get myself right mentally and physically, I can play for Kilkenny. I wouldn’t be going back if I wasn’t. “Is there a situation that I mightn’t be in the 26 (matchday squad)? Absolutely. “I’ve thought all that through and obviously I don’t want it, but I’m comfortable if that arrives at my doorstep and I’m not even in the 26. Email “Jackie Tyrrell: When I was 18 or 19, I would have been happy to be Kilkenny waterboy”. 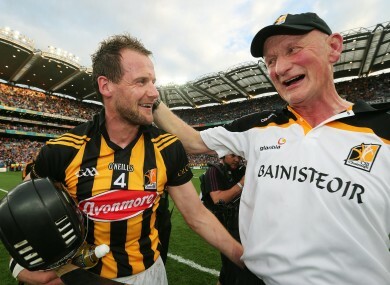 Feedback on “Jackie Tyrrell: When I was 18 or 19, I would have been happy to be Kilkenny waterboy”.